A varied session with roots in cerebral European improvisation, AACM-inspired sound experimentation and New Thing-era ferocity, Transit's self-titled debut demonstrates expert communication, the key to any successful cooperative venture. Although organized by percussionist Jeff Arnal, the members of the quartet share writing credits, relying on collective improvisation as their principle strategy. 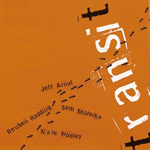 Though Transit's music is rooted in free jazz, these players are not constrained by preconceived notions. From the tumultuous vortex of sound that opens the album to later periods of guarded, pointillistic call and response, Transit operates with an intense dynamic range. Spanning hushed whispers to multiphonic blaring, former Anthony Braxton Ghost Trance Ensemble alto saxophonist Seth Misterka and trumpeter Nate Wooley plumb the depths of their respective horns for every available nuance of sound. Misterka's overblown alto blasting and keening invokes the ghost of Albert Ayler. Conversely, he can purr soulful blues laments. Wooley's introverted, Harmon-muted long tones alternate with the extroverted characteristics of his splintery, sputtering declarations. Reuben Radding's bass delivers subtle pianissimo harmonics one moment, pneumatic bass slaps and whiplash bowing the next. Jeff Arnal's drum kit dispenses everything from supple cymbalistic coloration to thrashing polyrhythms. Structurally, Transit alternates introspective and ghostly lyricism with more energetic excursions. Quiet insectoid sound explorations yield scrawled bass moans, muted trumpet whinnies, wispy saxophone trills, and minimalist drums that tap out coded secrets. As the album draws to a close, the energy level rises. Turbulent rhythms and torrid interwoven horns dominate as Arnal and Radding sporadically lock into tricky free bop grooves that propel Misterka and Wooley into spiraling heights of blissful elation. A snapshot of these improvisers in a pure improvisational environment, this scene is one that open-minded and adventurous listeners will want to take in. Track Listing: Cortelyou Q; Van Brunt; Gowanus Canal; Sabbath Siren; Brick City Part 1; Brick City Part 2; Journal Square; DerBlatt; Ditmas Park; Red Hook. Personnel: Jeff Arnal: percussion; Seth Misterka: alto saxophone; Nate Wooley: trumpet; Reuben Radding; bass.